SILK HANGINGS CREATED FROM SOUND. The sound of a pair of crows playing in the trees. A bird leaving a trail of sound. The twitting song of a wren captured on silk. We have a battle as to who 'owns' my studio. She can squeeze in through the smallest gap and now seems to have a husband. "I opened the doors and windows of my studio and listened to the stillness. The birds trilled in the trees as the sun rose in the valley. My pet sheep congregated around me mounching with the odd 'maaa' in the mists of morning. Lost in the moment of being, I 'drew' the sounds on the silk, marking each one with deliberation." "It is dusk now and the rain patters on the roof, a constant sound, broken only by birdsong and the occasional maaa. I captured the sounds of a peacock chattering in the field, safe from the nearby guns - a moment immortalised." Experiments with mixing thick print on dye paste with thick discharge created an exciting third element, a white crustiness cemented into the silk . 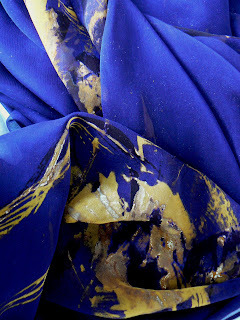 'Spirit' Silk crepe de chine Approximately 9 ft x 18 inches. The huge arc was difficult to create and that was taken from studies of the ceiling lights at Tremough. Within the dark aubergine coloured arc, representing 'The Cosmos', are three brilliant blue, horizontal lines representing healing. (difficult to see in these pictures). The white represents the etherial spiritual place (does it it exist or not - the floaty white tends to blend into the background). 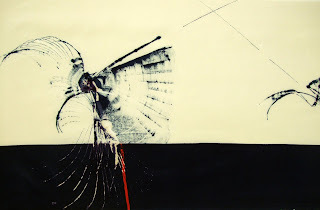 The imagery of the drawing is whatever you see in it, a butterfly, an angel, a bird? All designs and images are the copyright of Carol Mackenzie Gale and no image may be copied without my permission. Thank you.